Gluten-free options • Local companies, bakeries make avoiding flour a bit easier. 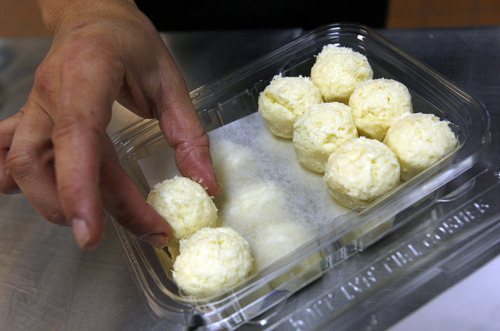 Francisco Kjolseth | The Salt Lake Tribune Debora Hammond scoops out small balls of dough featuring her family's recipe for cheese bread, which is a gluten-free product sold in area grocery stores. Francisco Kjolseth | The Salt Lake Tribune Debora Hammond pulls a fresh batch of gluten-free cheese bread from the oven recently. 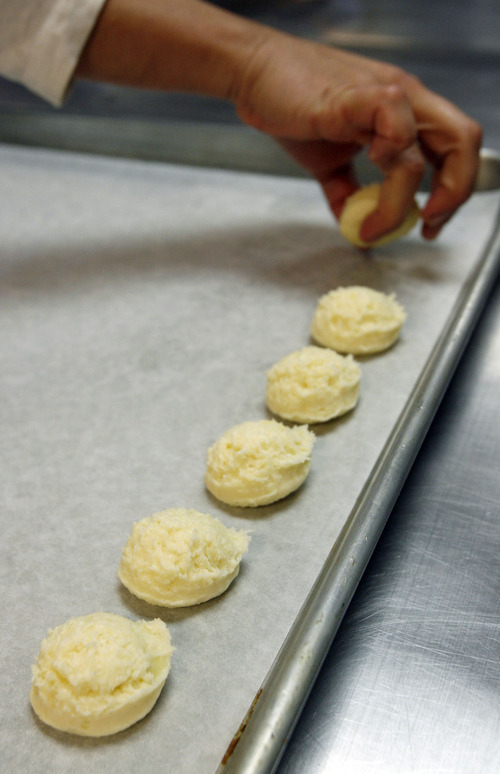 Francisco Kjolseth | The Salt Lake Tribune Debora Hammond scoops out small balls of dough featuring her family's recipe for cheese bread, which is a gluten-free product sold in area grocery stores. 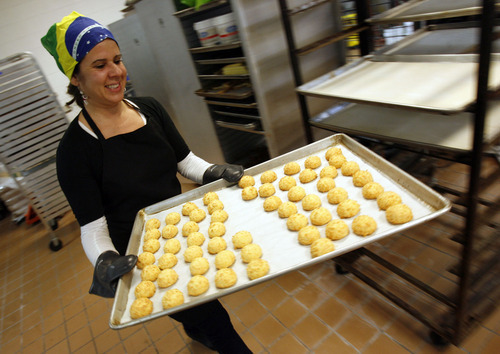 Francisco Kjolseth | The Salt Lake Tribune Debora Hammond arranges 24 balls of dough into a container featuring her family's recipe for gluten-free cheese bread, which is made with "manioc" or tapioca starch. Francisco Kjolseth | The Salt Lake Tribune A fresh batch of cheese bread cools in Debora Hammond's small bakery in Salt Lake recently. Francisco Kjolseth | The Salt Lake Tribune A fresh batch of sun-dried tomato, gluten-free cheese bread cools in Debora Hammond's small bakery in Salt Lake recently. Most people buy Debora Hammond's frozen bread dough because these miniature rolls are irresistibly crispy on the outside and soft on inside when baked. 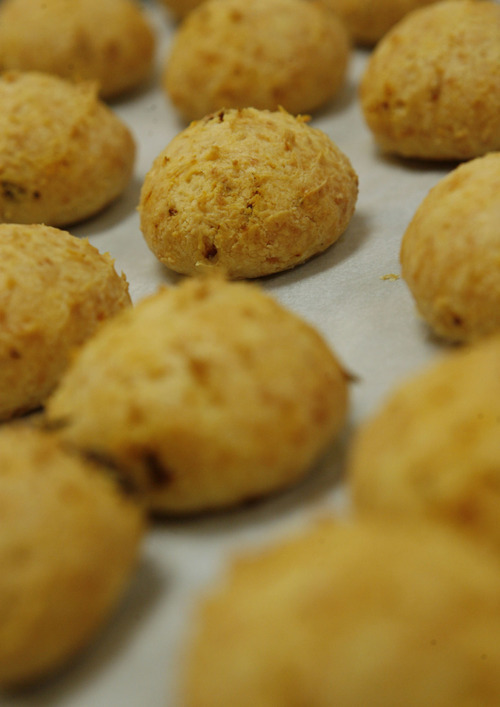 But some customers have one more reason to seek out boxes of her Brazilian cheese bread, as they're gluten free. It was a niche the 37-year-old entrepreneur didn't anticipate when she started Cheese Bread Mania last year, using a family recipe that dates back to her great-grandmother. "A friend is the one who pointed it out," Hammond said. Her family, like most Brazilians, has always made the bread using manioc starch, a flour-like substance made from the yucca plant. Hammond is just one of several Utah bakers finding success off the wheaten path. The gluten-free foods they produce solve a health demand and satisfy the latest diet craze. In 2009, Hammond left her job as a computer support technician to start her company. The first week at Salt Lake City's Downtown farmer's market she sold about 25 packages of her take-and-bake dough. Today her cheese breads are sold in 25 Utah stores, including Harmon's, Rico's and Caputo's Market and Deli. The single mother attributes part of her success to the bread's wheat-free ingredients, as it accounts for about 20 percent of her business. About one in every 133 people in the United States has Celiac disease, making them unable to eat foods with gluten, a protein that occurs naturally in wheat, barley and rye. When celiacs consume products with gluten, it damages their small intestine and can cause a host of problems, from abdominal pain and diarrhea to chronic fatigue. Recently, a growing number of people are choosing to eat gluten-free for other reasons. Some say reducing or completely avoiding gluten gives them more energy, while others say it helps them lose weight. According to statistics from Dieting Monitor, which tracks national diet participation, about 25 percent of all U.S. adults are either trying to reduce or completely avoid gluten in their diets. This means there are a lot of people eating gluten-free foods who probably don't have to for medical reasons. The diet is being fueled, in part, by talk-show hosts and celebrities such as actress Gwyneth Paltrow and former first-daughter Chelsea Clinton, whose wedding cake was reportedly gluten-free. Some health experts consider gluten-free something of a diet fad  much like the low-carb craze from a few years ago. Whatever the reason, the toughest part about eating a gluten-free diet is finding a substitute for baked goods such as bread, pasta, crackers, cookies and cakes. That's according to Margo Anderson, a Sandy mother, and author of http://www.offthewheatenpath.com, who was diagnosed with Celiac disease eight years ago. "Back then, all the breads were crumbly and tasted terrible, and the pasta was so disgusting," she said. Offerings are a lot better now, as gluten-free products are one of the fastest growing food categories in the country. And many Utah companies are part of the trend. Within the last year, two gluten free bakeries have opened in Utah: Kaysville's Sweet Cake Bake Shop and Sandy's Eleanor's Bake Shop. There also are several other small companies, like Hammond's, that don't have a storefront, but make and sell their gluten-free items in area grocery stores. 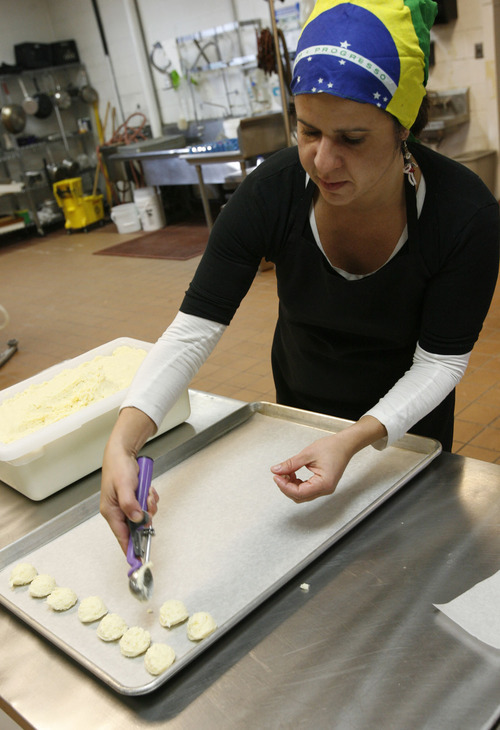 Three years ago, Pam Schulte, owner of Lucky Spoon Bakery, started experimenting with gluten-free cookies at home. Her husband, who has Celiac disease, refused to buy the store-bought varieties as they were dry and lacked flavor. "That inspired me to come up with my own cookies," said Schulte, who uses a blend of rice flour, potato flour and almond meal, as well as fresh butter, eggs and brown sugar. Her soft, chewy cookies are available in the freezer section at Harmon's and soon will be available at The Market at Park City. After years of reading labels and searching the Internet for products that are truly "gluten-free," Anderson, like many celiacs, is grateful to see products like Schulte's in the grocery store. "It's such a relief to see those two little words on the label," she said. "Because you know it's safe." Here are some Utah-based companies that specialize in gluten-free baked goods. 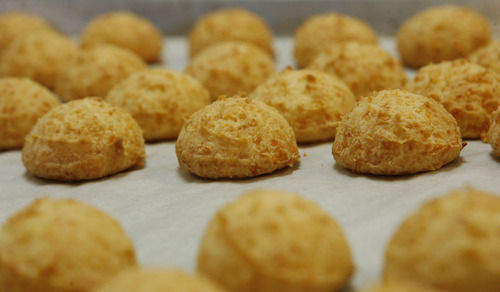 Cheese Bread Mania • Makes a traditional Brazilian cheese bread available in take-and-bake dough form. A box of 24 miniature frozen rolls is available for $10 at Harmon's, The Store, The Store, Too, The Market At Park City, La Super Pequenita, Bountiful Nutrition, Tenochtitlan Market, Peterson's Market Place, Mercado Latino del Utah, La Strellita del Sur, Beehive Health Essentials, Layton Gluten Free Foods. Order online at http://www.cheesebreadmania.com or call 801-637-5094. Eleanor's Bake Shop • 9495 S. 560 West,. Bldg. D, Sandy; 801-563-7466. Bakery sells gluten-free breads, cake pops, cookies and brownies. Sandwiches on South American arepa bread are also available. Open Monday-Friday, 11:30 a.m. to 6:30 p.m.; Saturdays 9 a.m. to 3 p.m.
Sweet Cake Bake Shop • 237 W. 200 North, Kaysville; 801-444-3288. Bakery sells gluten-free breads, cupcakes, cookies, flour blends and mixes on site. Open Tuesday-Saturday, 10 a.m. to 6 p.m.
Tree Street Grains • Gluten-free pancake mixes, available at Harmon's for $7.50 a bag. Special orders at treestreetgrains@gmail.com.